Luke is meeting with potential adopters soon! If you would like to be added to the waitlist, please send us an inquiry. 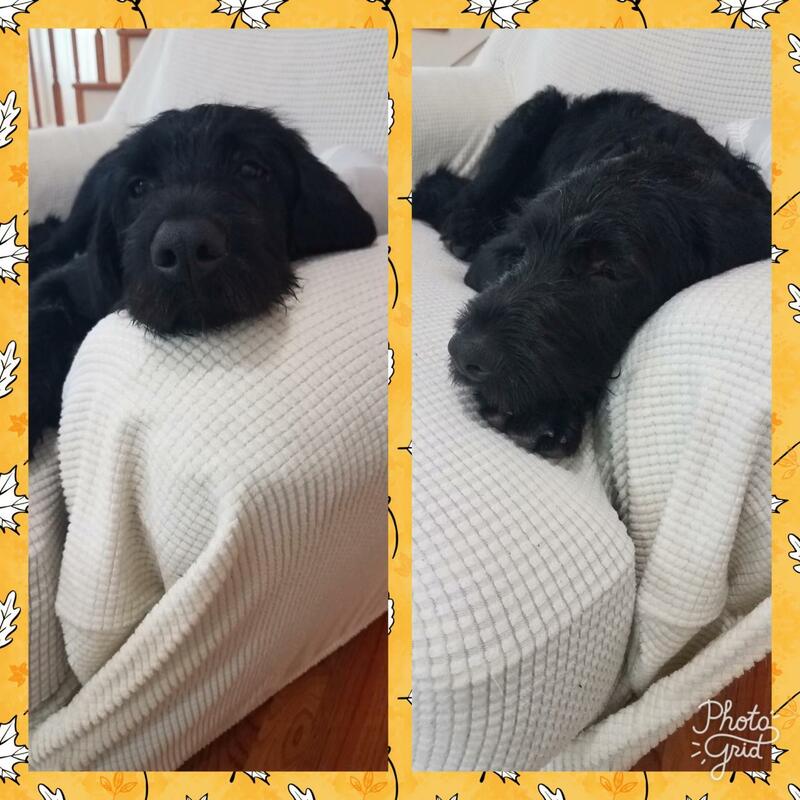 Luke is a 6-month-old labradoodle with a history of seizures, so requires medication multiple times a day. He is very good about taking his pills and even though he gets very excited for his "peanut butter treats" he knows to "sit" and "leave it" until he's told it's "ok" to get the treat. The other 99% of the day he is a normal, high energy puppy. He loves meeting new people, but can sometimes be a little overwhelming because he's so excited to me them. He loves snuggling with you on the couch or in bed. Luke loves playing with all dogs, both large and small. Although he loves all dogs, not all dogs he's met have loved him, and it has been difficult for him to understand why some dogs don't want to play with him. He has only met one kitten, but after one "bop" on the nose he quickly learned to avoid her. 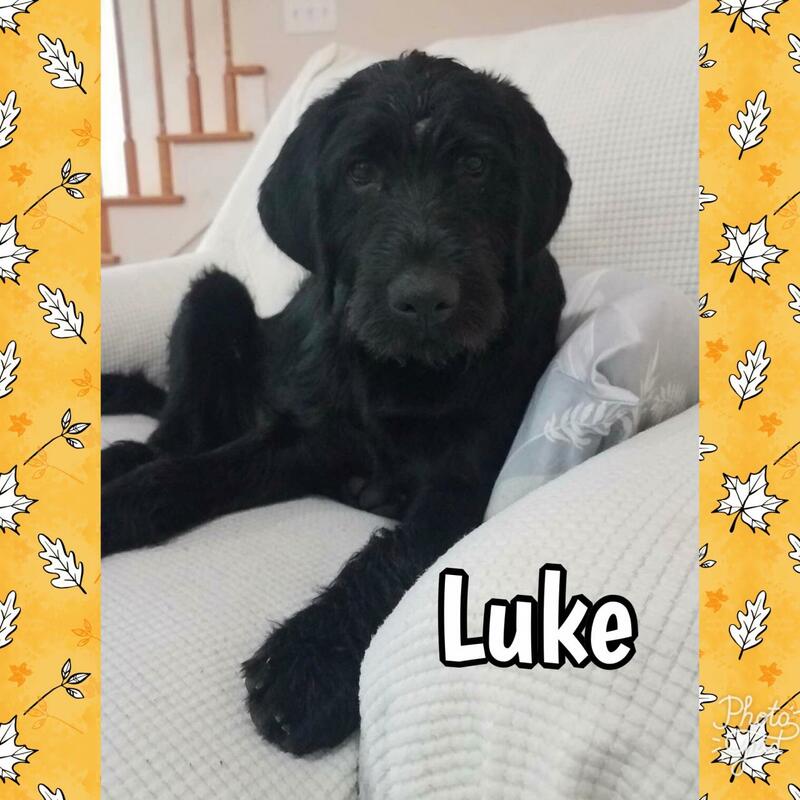 Although Luke hasn't met any children, based on his size and energy level he would probably do well with older children. He is crate trained and mostly house trained. Luke loves playing fetch and knows "drop it" and "leave it" so that you can throw the ball for him again and again. If you are busy, he is happy to entertain himself by dropping toys off the edge of the couch and retrieving them, or rolling a ball down a hill and chasing it. He loves spending time outside, sniffing around his yard or laying in the sunshine. He would do well in a home willing to give him a lot of love and attention with plenty of space for him to run around and be a puppy. As mentioned above, Luke is on medication for seizures. Since coming into AWFP's care in early November, his dose of Keppra has increased and he is also now on phenobarbital. This combination is currently managing his seizures. Neurologists suspect that Luke has a congenital diffuse forebrain lesion (brain abnormality) that is causing his seizures. In order to have a more definitive diagnosis, an MRI would be needed, but it would unlikely change our treatment plan. We do not know the prognosis of Luke’s condition, nor whether his seizures will worsen or become uncontrollable. What we do know is that he’s loving life right now and has no idea that it’s not normal to lose a couple minutes of consciousness from time to time. Luke also has various congenital abnormalities in his left eye that limit his vision. Surgery could be attempted to correct the cataract, but it carries a variable prognosis for improved vision. Luke's ocular abnormalities appear to be causing visual impairment, but do not appear to be causing discomfort at this time. We require all animals in the household to be up-to-date on core vaccines. Dogs must be vaccinated against rabies, canine distemper, and Bordetella. Cats must be vaccinated against rabies and feline distemper. All of our animals are in foster homes. We will schedule meet and greets after approving your adoption application to ensure our fosters are only meeting with serious applicants. Please allow 1-2 week for approval as AWFP is is run by volunteers who are full-time veterinary students.